On February 9, Thai tourists arriving in Okinawa on a charter flight from Thailand receive a warm welcome at the international terminal of Naha Airport. The tour is an interactive charter tour planned by Jumbo Tours in Naha and on February 9, 187 tourists also departed from Okinawa for Thailand. 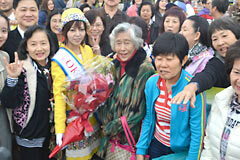 The company plans to arrange a charter tour again to coincide with the Naha Festival in October.